Do you want to avoid one of the most taunting and complex cleaning tasks that exists at your home? 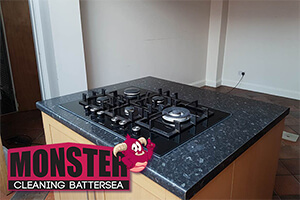 Well, just give Monster Cleaning a call, sign up for our premier quality oven cleaning service in Battersea and leave everything else to the pros. Over the years we have managed to complete thousands of projects related to sanitation of kitchen appliances, not only in homes but also at business establishments such as restaurants, hotels, hostels and even hospital canteens, and we are more than certain that the oven sanitation solution we offer you here is one that is up to the highest industry standards. Take note that on top of the great prices that we operate on, we offer some pretty nice deals and package discounts for all of our clients to make use of. Any end of tenancy cleaning service for over £100 comes with a free oven cleaning. A single oven and hob extractor sanitation will cost you now just £75. And so on and so forth. We are always looking for new ways to make your life better, more comfortable and cheaper. And we are more than certain that we are succeeding. Our oven cleaning Battersea covering service is available not only to residents of the area, but to businesses as well. You want the highest levels of hygiene at your restaurant’s kitchen, right? Well, we can help you with that by making sure that the place where you actually prepare the food is spotless. Naturally, we will do that at time that will cause no disturbances to your business process, so you really have no reason to worry. Call us now for booking, or request your free quote through our easy to use online contact form.